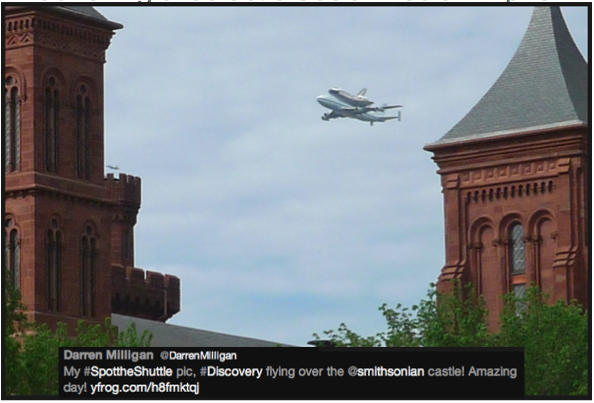 On Tuesday, I watched the Space Shuttle Discovery piggyback over Old Town Alexandria with several hundred others who gathered at the waterfront. 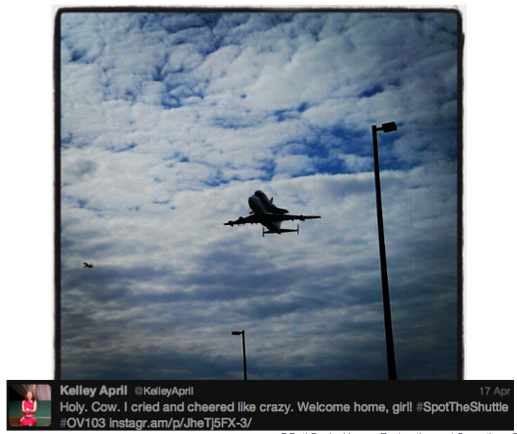 When Discovery appeared in the sky, I cried. The intensity of emotion that flooded over me took me totally by surprise. 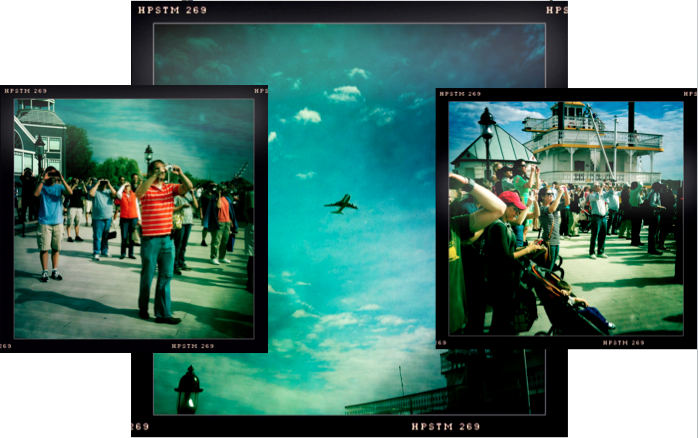 I thought I was over it — that I’d moved on after the final Space Shuttle mission. I was wrong. It hit me hard. On Thursday, I was scheduled to speak at the first ever #140cuse social media conference at Syracuse University in New York. My topic: Launching a Galactic Social Media Empire. The format for the conference is 10 minute presentations. 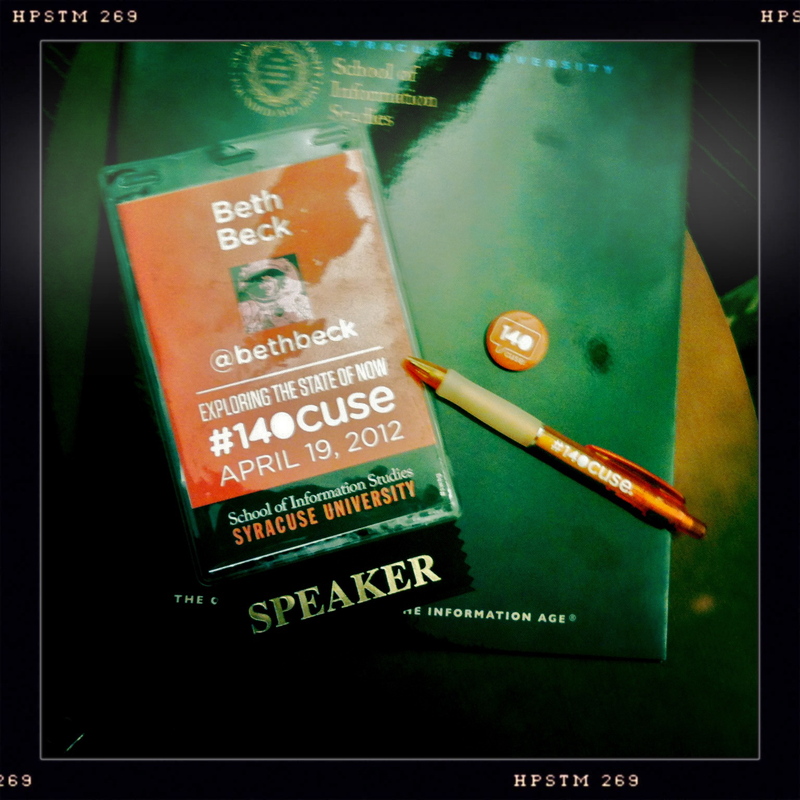 You can browse the list of speakers on the #140cuse Conference website. “One must learn by doing the thing, for though you think you know it, you have no certainty until you try.” — Sophocles, 400 B.C. 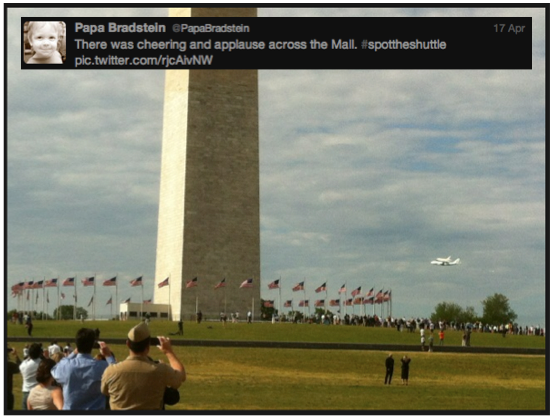 After an emotion-filled experience with Discovery, I changed the focus of my talk from creation of a social media empire to the outcomes from a social space empire — specifically the #SpotTheShuttle campaign. 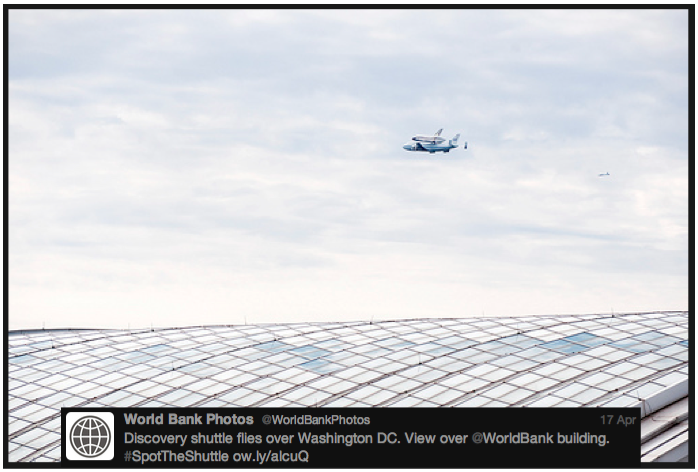 Social media connected us in awe and wonder as we looked up to the skies to witness a seasoned spaceship flying by the power of her Earth-bound transport over the nation’s Capitol on her way to retirement at the Smithsonian Udvar-Hazy facility. Discovery RULES the Galactic Social Media Empire! Farewell, dear Discovery. You are well-loved. You have served us well. You’ve given hope to Earthlings of all shapes and sizes, ages and interests for almost 30 years. 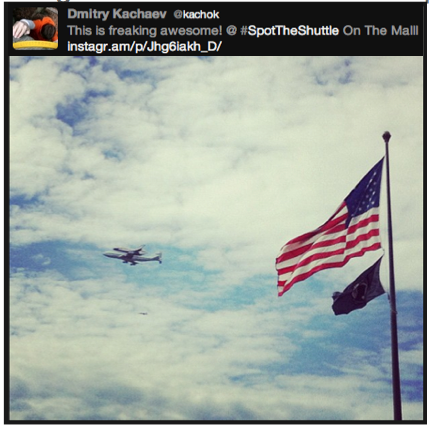 You are the third spacecraft to join the Space Shuttle fleet, and the first to be retired. You were born on August 27, 1979 and took four years to roll off the assembly line. You were named after two exploring ships of old. One of your namesakes carried Henry Hudson to explore the Hudson Bay in the early 1600s, searching for a northwest passage from the Atlantic to the Pacific. Your other namesake carried British explorer James Cook on his adventures to the South Pacific in the 1770s. On this voyage, he discovered the Hawaiian Islands. 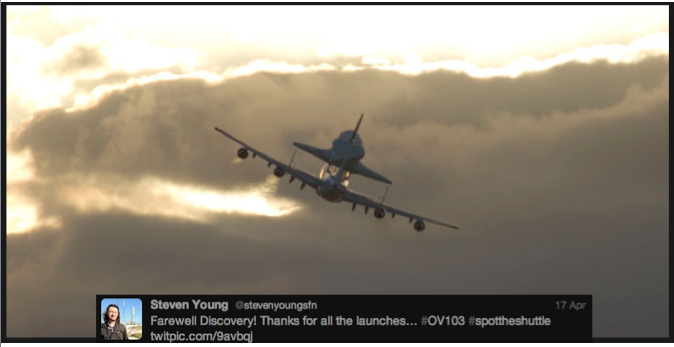 Discovery, we thank you for taking us back to space after both our Challenger and Columbia tragedies. You were the first US spacecraft to meet up with the Russian Mir orbiting space station, and the first to be flown by a female pilot, Eileen Collins — who later became the first female commander. You returned Astronaut John Glenn to orbit as the oldest human to fly in space. You traveled 148,221,675 miles in space for a total of 365 days off the planet. You orbited Earth 5,830 times, and gave 242 humans the ride of their lives. I’m sorry I wasn’t one of them, but I was with you in spirit as you soared through the heavens at 17,500 miles per hour. 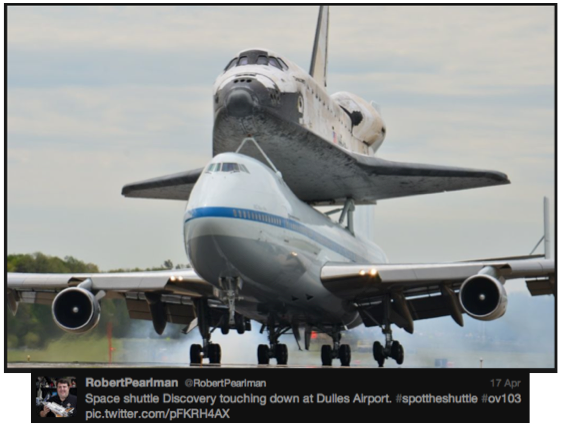 I look forward to seeing you fly over us today as you piggyback your way to Dulles for your final retirement home at the Smithsonian’s Udvar-Hazy facility in Chantilly, Virginia. Look down. 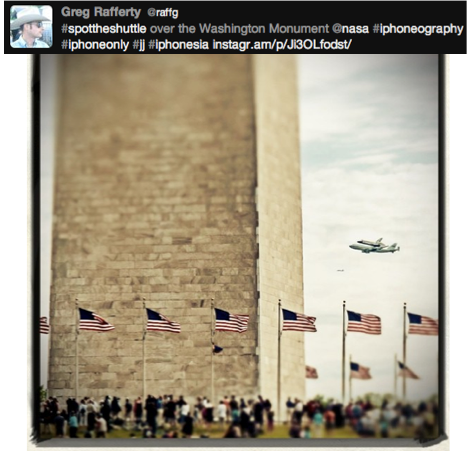 I’ll be waving wildly and snapping your photo with my iPhone. Discovery, we love you. 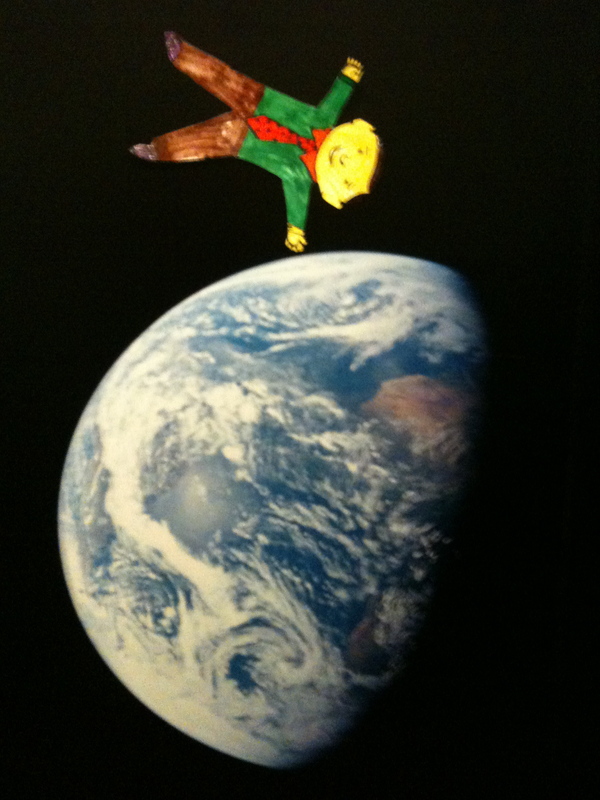 We’ll miss seeing you break the Earth’s gravitational boundaries. But, I know you’ll continue to break hearts (in a good way) as long lines of Earthlings come see you for the first time. Enjoy your retirement. You deserve it. Final Godspeed to you, old girl! How many times have you shared an idea, only to be told it would never work? While you’re busy counting, I can tell you I lost count several lifetimes ago. Think about the dreamers who designed the magnificent reusable space vehicle we know as the Space Shuttle. Though they believed winged flight from space back to Earth was possible, could they ever have imagined 30 years of reliable service? Yes, we’ve experienced two tragedies, but we’ve also witnessed 20,952 orbits around Earth by the fleet — prior to next week’s final flight of the Space Shuttle Atlantis. Time in space for 134 flights: 1,320 days, one hour, 32 minutes, 44 seconds. Prior to the final mission, STS-135, the five Orbiters traveled 537,114,016 miles. Discovery flew her maiden voyage in August 1984 with STS-41D. She served as the Return to Flight missions after both accidents. She flew 148,221,675 miles, 39 flights, and 365 days (ONE FULL YEAR) in space. As the most seasoned Orbiter, Discovery retired first following the STS-133 mission. Endeavour is the baby of the fleet. She was the last built, ordered to replace Challenger. She flew her first mission, STS-49, in May, 1992. She retired second after flying 122,883,151 miles and 25 missions and 299 days in space through her final mission, STS-134. Atlantis flew first on October 3, 1985 during the STS-51J mission. 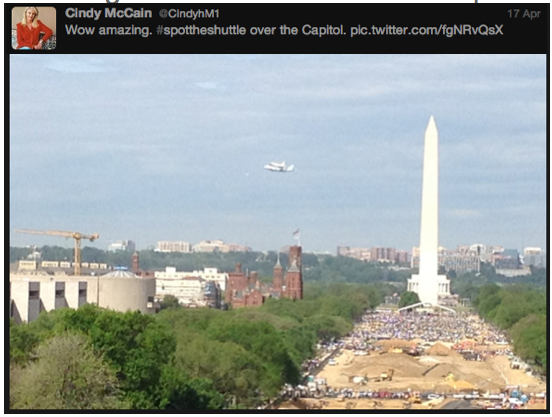 She is the last operational vehicle in the Space Shuttle fleet. Prior to this final mission, she’s completed 32 flights and 120,650,907 miles and 293 days in space. Over the last 30 years, the five Orbiters carried human cargo to space and back: 848 before this final flight of Atlantis, which carries a crew of four: Commander Chris Ferguson, Pilot Doug Hurley, Sandy Magnus and Rex Wilheim. At the end of the Space Shuttle program, 852 humans can boast about riding a rocket to space and glider back to planet Earth. Think about the stories they’ll tell their grandchildren and great grandchildren — about a time when humans allowed themselves to think unthinkable thoughts. And when they did, they created something amazingly awesome: a reusable winged space plane. If we keep thinking unthinkable thoughts, we can do unimaginable things and go unforeseenable [yes, I know this is not a word, but I like it] places. Parents, believe your kids can do more than seems possible. Give them a leg up: support them even if it means sacrifice on your part. Teachers, open your students’ eyes to the wonder of the universe. One of them may be the first to build a personal spacecraft or step on Mars without the need for a bulky spacesuit. Bosses, give your employees an opportunity to create new products and processes. Allow them the flexibility to think outside the box without fear of retribution. Even as we close out the Space Shuttle program, tomorrow holds great promise if we dare to dream it. So, let’s get to it! French photographer Thierry Legault takes some amazing photographs of our spacecraft. See what I mean? 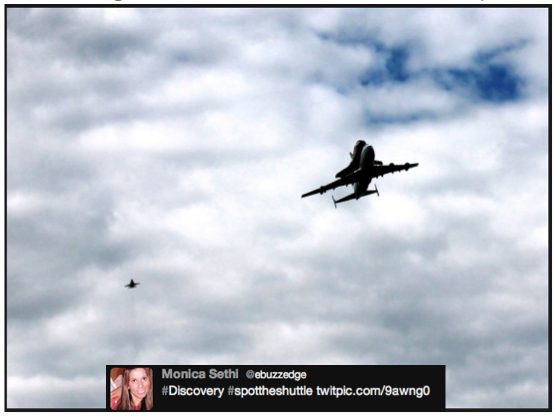 STS-133 Space Shuttle Discovery approaching Space Station to dock. Permission granted by Thierry Legault. STS-133 Spacewalk as seen from Earth. Permission granted by Thierry Legault. 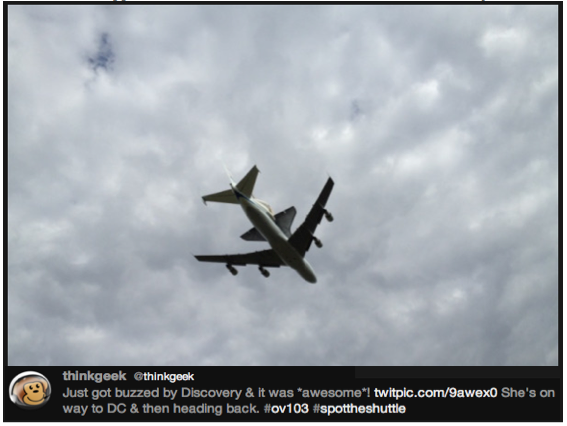 You are looking at images of Space Shuttle Discovery’s final mission to Space Station. Soak in the significance of these images. 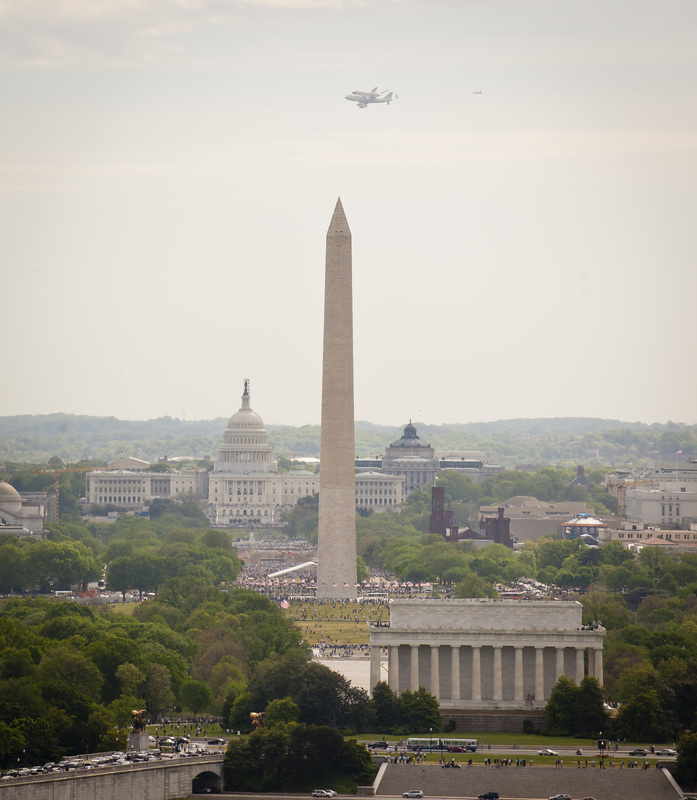 We are closing out the final chapter in our nation’s Space Shuttle program. (But you already knew that, right?) So cool that we have photographers like Thierry out there caring enough to record this journey for us. Let me share the back story of our NASA relationship with Thierry. 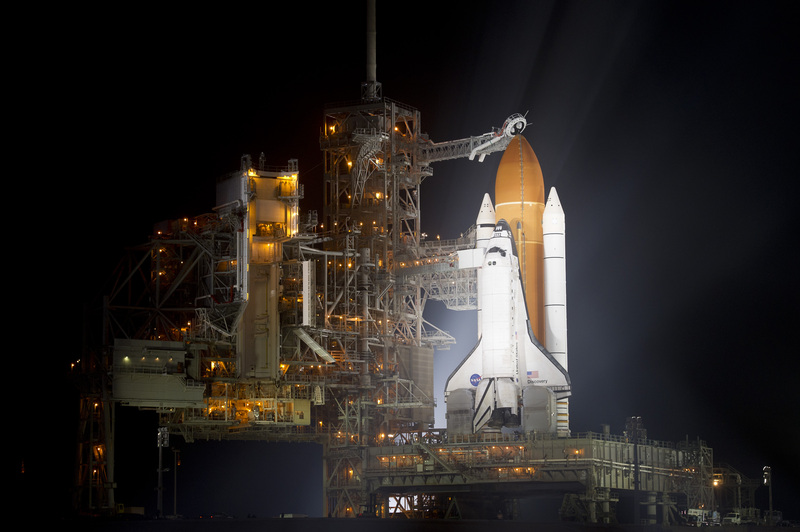 It all began back in September 2006, when Space Shuttle Atlantis launched to orbit for STS-115, a 11 day-19 hour-6 minute mission to Space Station and back. 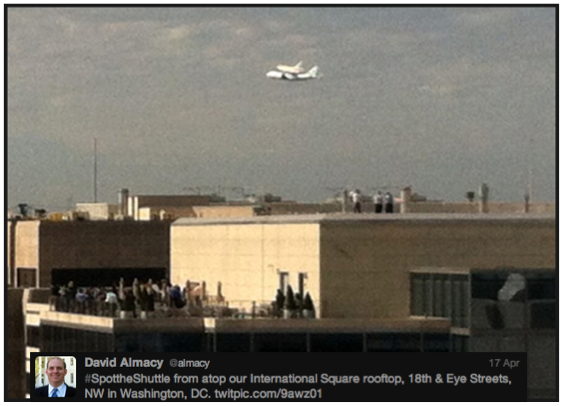 Thierry captured this image. 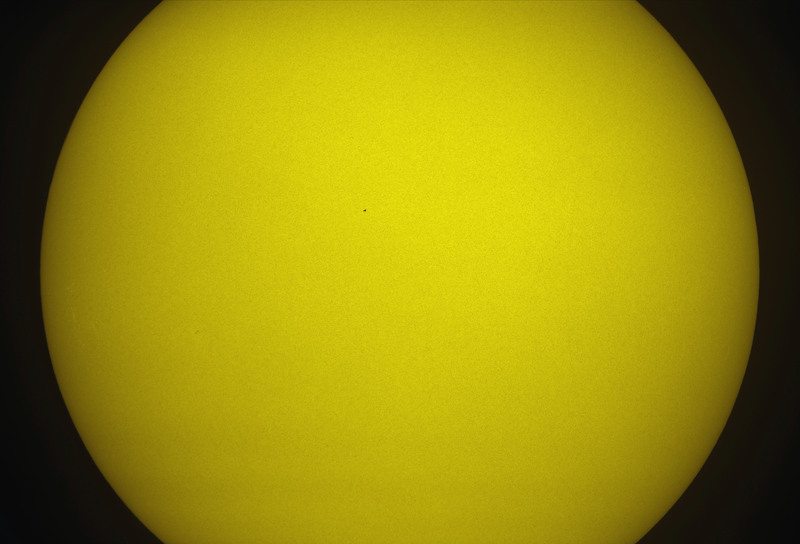 STS-115 Atlantis & Station in front of the sun. Permission granted by Thierry Legault. Note: Space Station had a totally different shape then. We were only six years into the decade-long construction project. 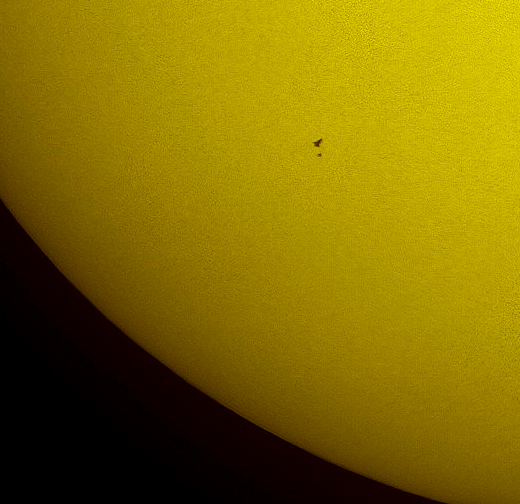 Your image of Station and Shuttle in front of the sun is absolutely FABULOUS! 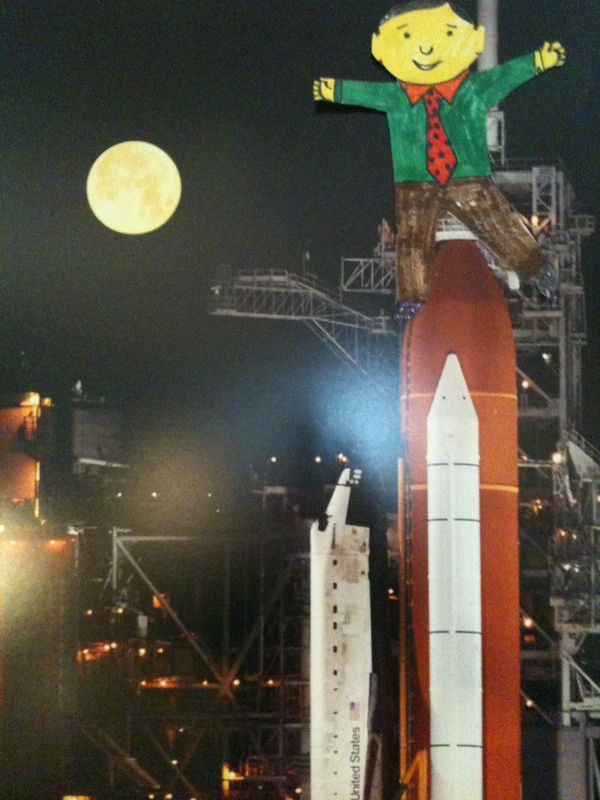 May we have permission to use the photo with our NASA exhibits? We would give you credit, of course! Your image is the most striking I’ve ever seen, and the fact that the Shuttle and Station are in the same shot from Earth is incredible. 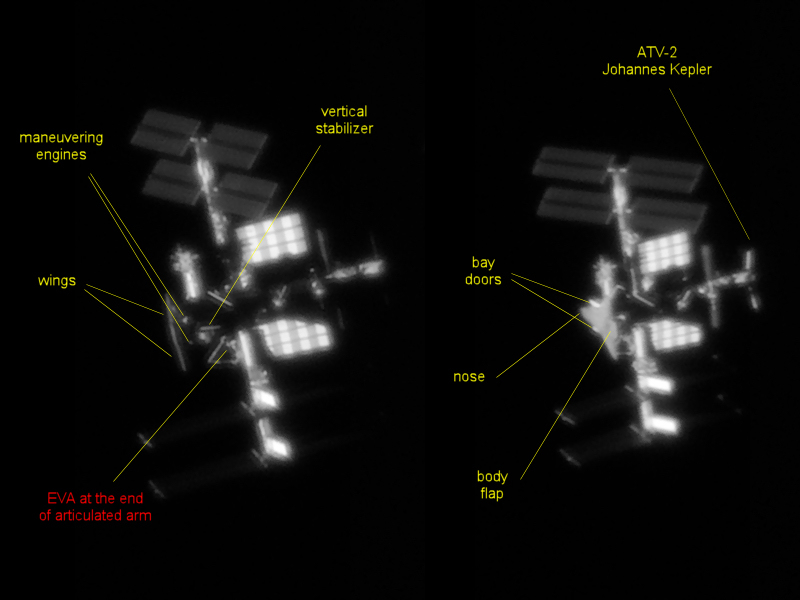 The general public has trouble getting excited about Station because we’ve built it in orbit. They’ve never seen it, except in our images from space. Your image allows them to touch space from home. He contacted me almost immediately and agreed to let us use his photo. We were thrilled! For me, the story this image tells is that humans (and the things we create) are SO tiny against the awesome backdrop of the universe we live in. Wow! Plus, we can allow folks at home a glimpse of of the incredible engineering marvel we’re building UP IN SPACE. Fast forward to August 2008, we received an email from Thierry that he was interested in taking pics of his beloved Atlantis during the STS-125 Hubble servicing mission. The only problem was, Hubble orbits 35o miles over Earth. Space Station orbits 220 miles overhead. 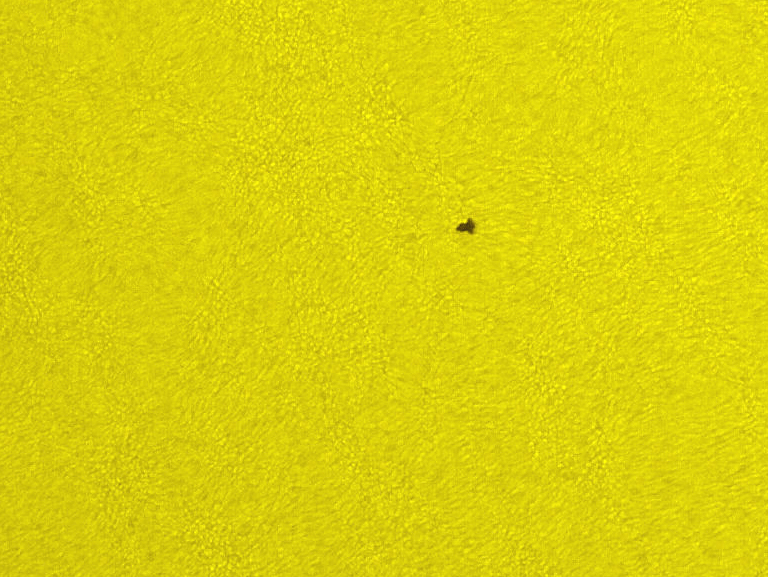 He couldn’t afford the special lens required to capture the image — an additional 130 miles UP in the sky. He wanted to know if we had one, or were willing to buy one, so that he could record such an historic event — the final Space Shuttle repair mission to Hubble. Thierry traveled from France to Florida for the STS-125 mission. Our own excellent Bill took Thierry along with him for all his official duties, giving Thierry access to the best NASA locations to photograph the mission. What did we get out of the deal? 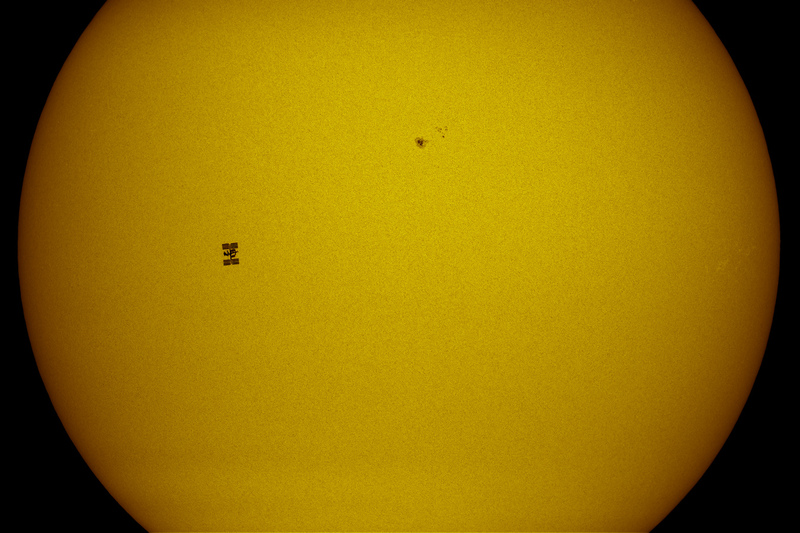 Incredible images of Space Shuttle Atlantis and Hubble in front of the Sun, that’s what! The images went viral. 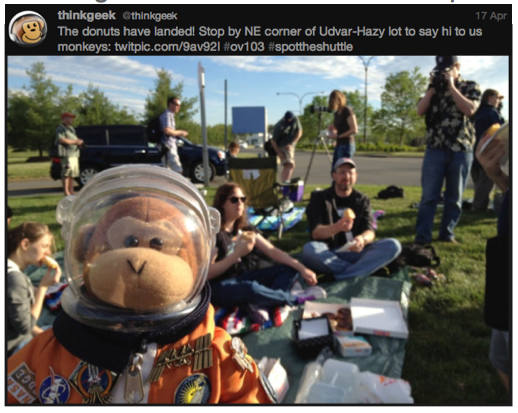 Newspapers, websites, blogs, tweets around the world gushed about Thierry’s images of our spacecraft. What’s not to love? 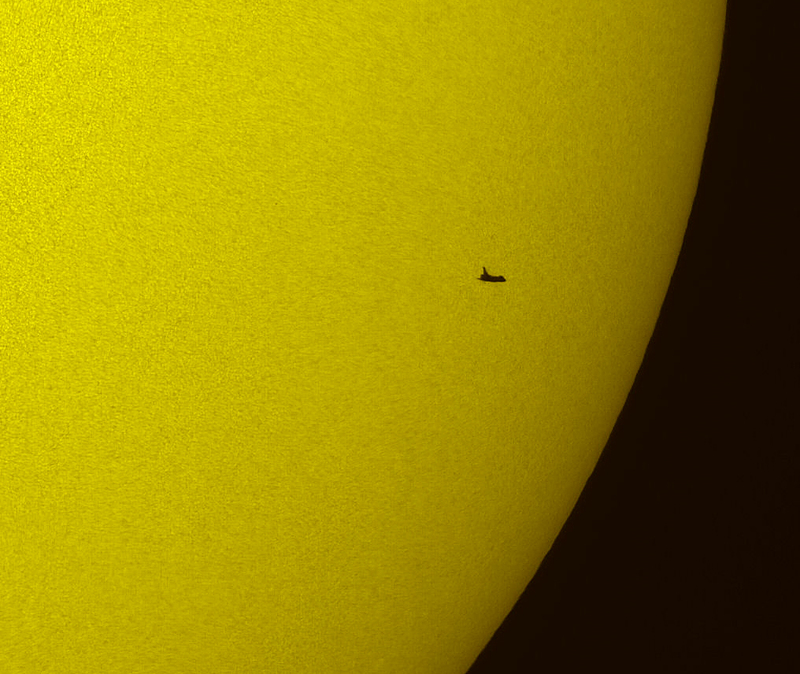 STS-125 Atlantis and Hubble Solar Transit. Credit: NASA/Thierry Legault. 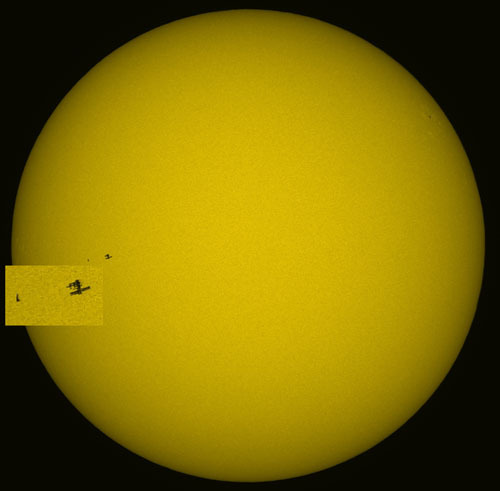 STS-125 Atlantis Solar Transit. 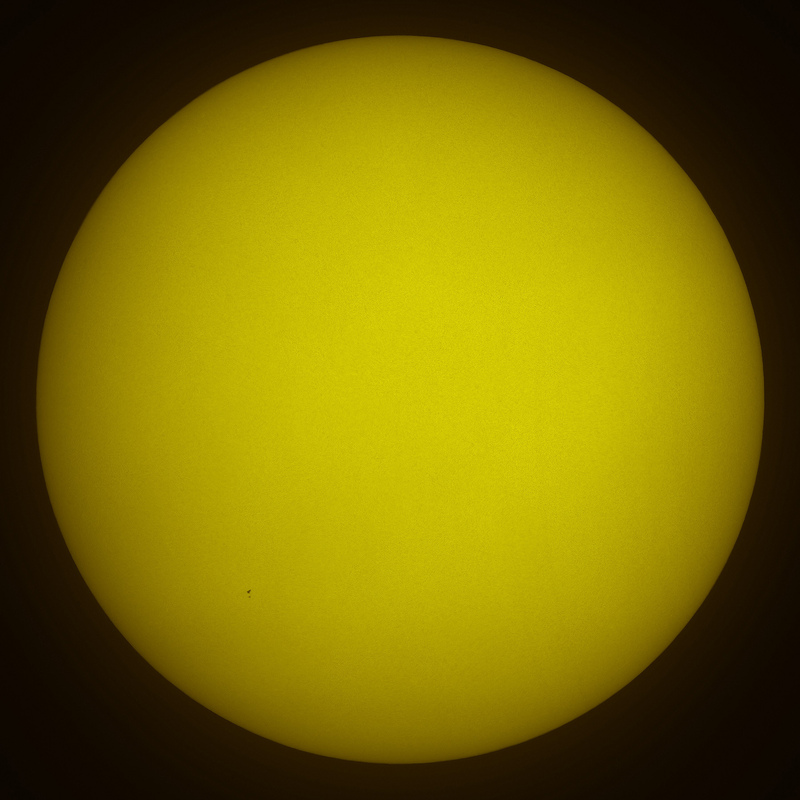 Credit: NASA/Thierry Legault. 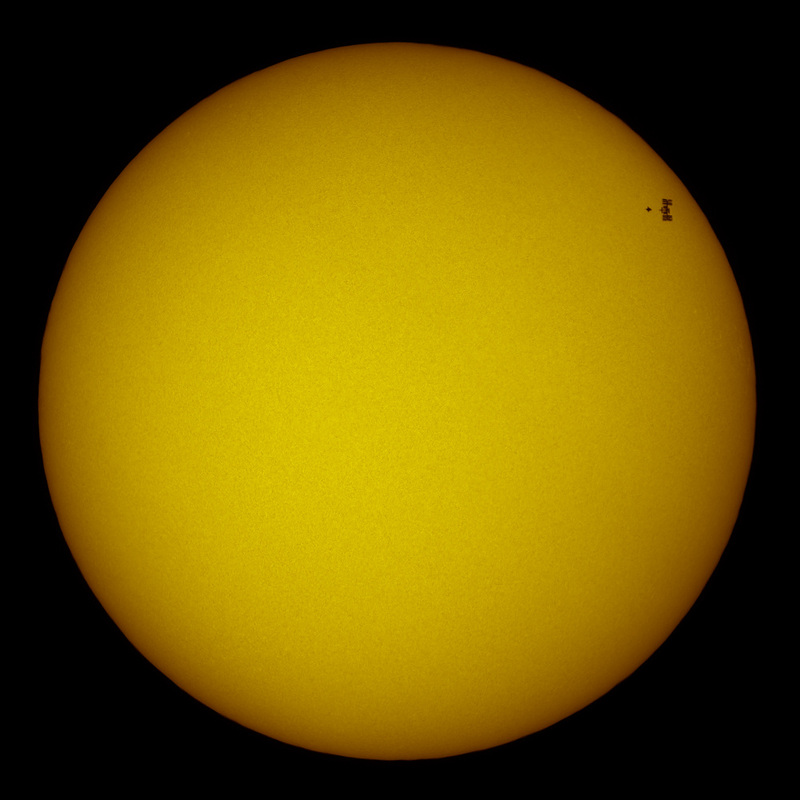 STS-125 Solar Transit. Credit: NASA/Thierry Legault. Thank you Thierry for sharing your photos (and your amazing talent) with us. You’ve perfectly captured the drama and awe and wonder of space. Hot off the presses (or email): After posting this morning, Thierry sent me more images to share with you. How many times can I say WOW!!! Simply breathtaking! 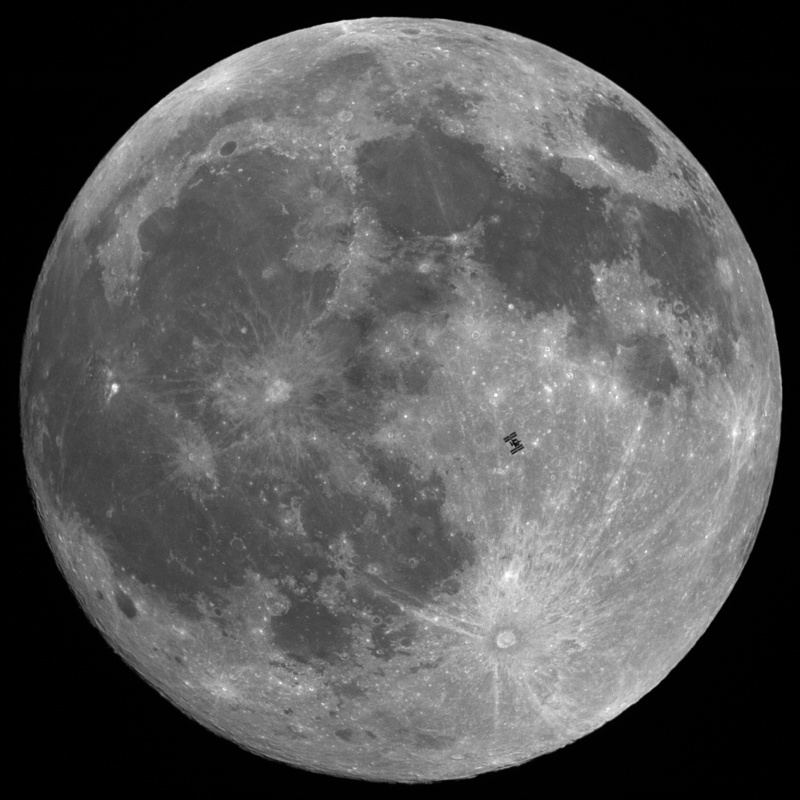 Space Station during Lunar Eclipse 12/20/2010. Permission granted by Thierry Legault. 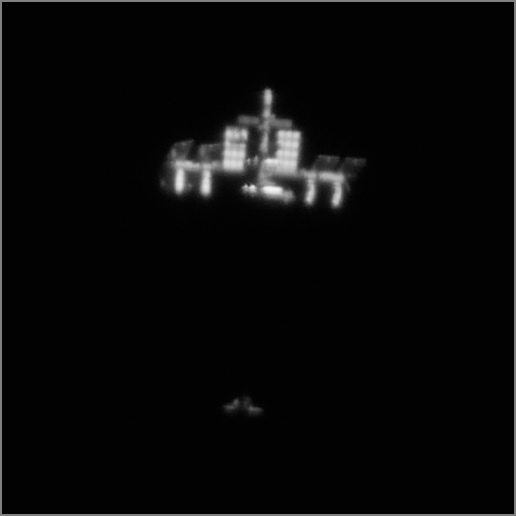 STS-132 Space Shuttle Atlantis docking with Space Station 05/16/2010. Permission granted by Thierry Legault. STS-132 Space Shuttle Atlantis docked to Station 05/22/2010. Permission granted by Thierry Legault. 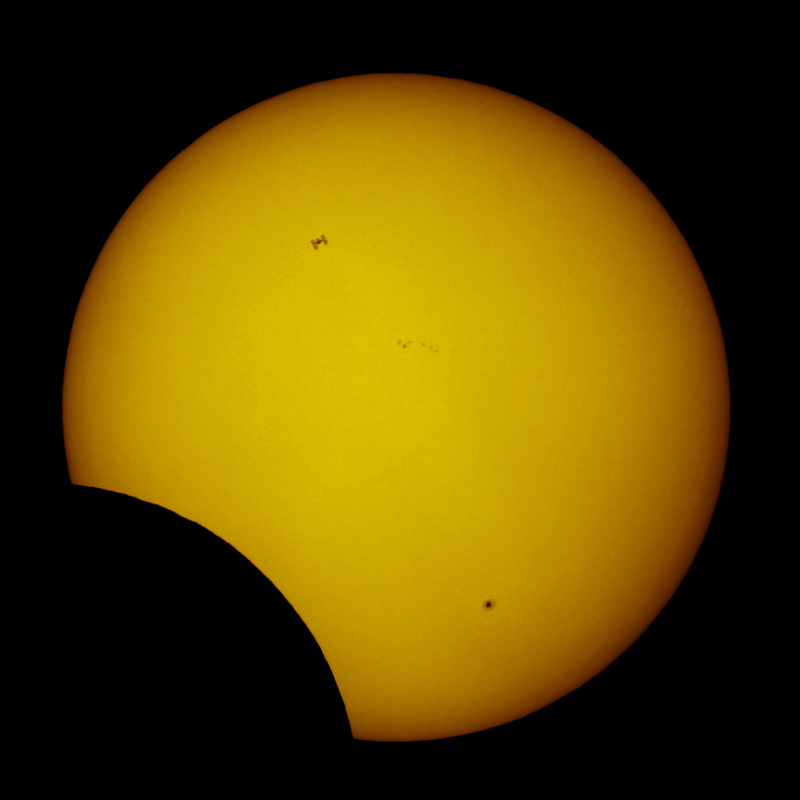 Space Station during Solar Eclipse 01/04/2011. Permission granted by Thierry Legault. Hi! 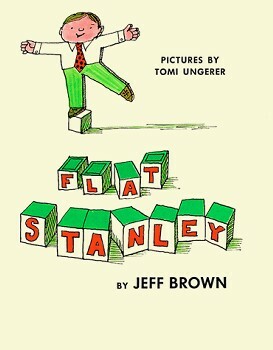 My name is Flat Stanley. I belong to Nathan Woolverton, Beth Beck’s adorable nephew. Nathan’s class has an assignment to send me on an adventure. 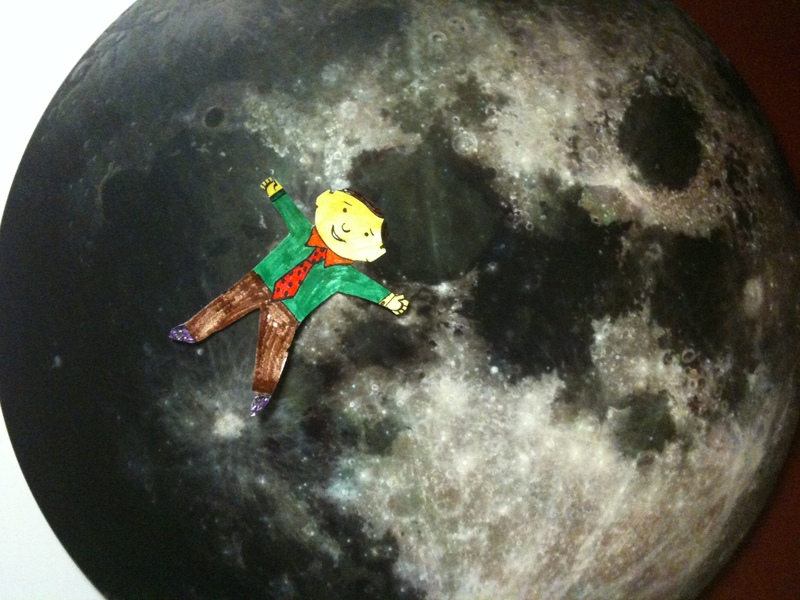 I’ve always wanted to go to space, so I asked if Nathan’s aunt Beth would take me to work with her. She works at NASA, you know. So, Nathan’s mom popped me into a mailer and here I am. I’m flat, you see, so I don’t cost much in postage to get from Texas to DC. Beth told me you might not know who I am. Really? Wow. I guess I better tell you a little about myself. I was born in 1964. My real name is Stanley Lambchop. My younger brother is Arthur. My dad gave me a bulletin board that fell on my bed, squashing me flat. Hey. Don’t worry. It’s not as bad as it sounds. I kinda like it. I’ll never grow bigger or older than I am now. How cool is that?!? AND, I can slip inside an envelop, fax or email to go ANYwhere I want. I’m getting to see much of the world. But Nathan is special. He sent me on an out-of-this-world adventure. I dare you to top this! I’ve been sending Nathan email pics of my adventure. I have to write a journal too, so Beth thought a guest blogpost would let all of you enjoy my incredible experience. Now my class journal can be a virtual learning tool. Note: In case you’re wondering, I’m dictating my comments to Beth. I haven’t quite mastered typing on a keyboard with my flat fingers. Fellow Earthings, prepare to get VERY jealous. First of all, you should know that the weather in DC is very cold, icy and snowy in the winter. 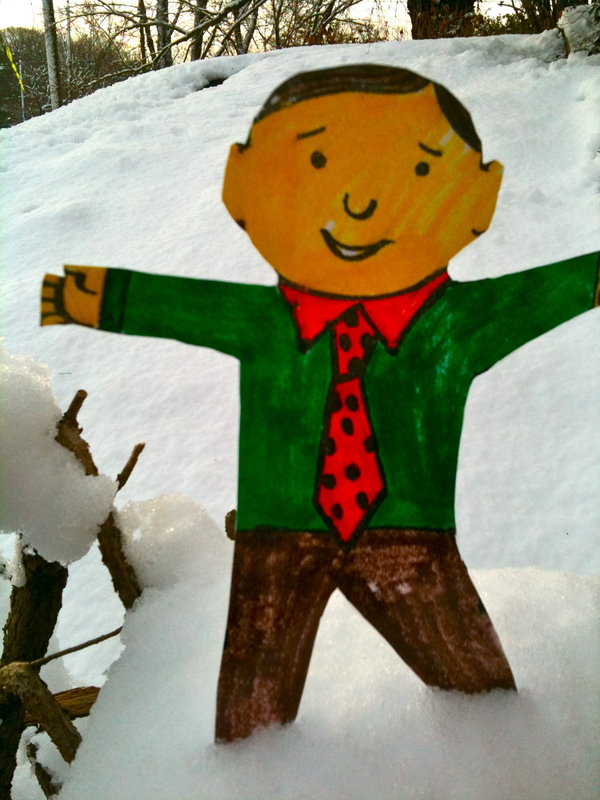 But while I’ve been up here, Nathan and his class have seen two snowstorms. Quite amazing — since he lives in warm sunny Texas. We had to shovel our way out before Beth and I could drive to work. We were both sweating inside our snow clothes. It’s hard work! Washington DC: I helped shovel snow. The U.S. Office of Personnel Management allowed federal government workers to telework or take vacation time off — just to keep thousands of drivers off the snowy roads. Beth had a meeting, so we drove in to work together. You know NASA is a government agency, right? 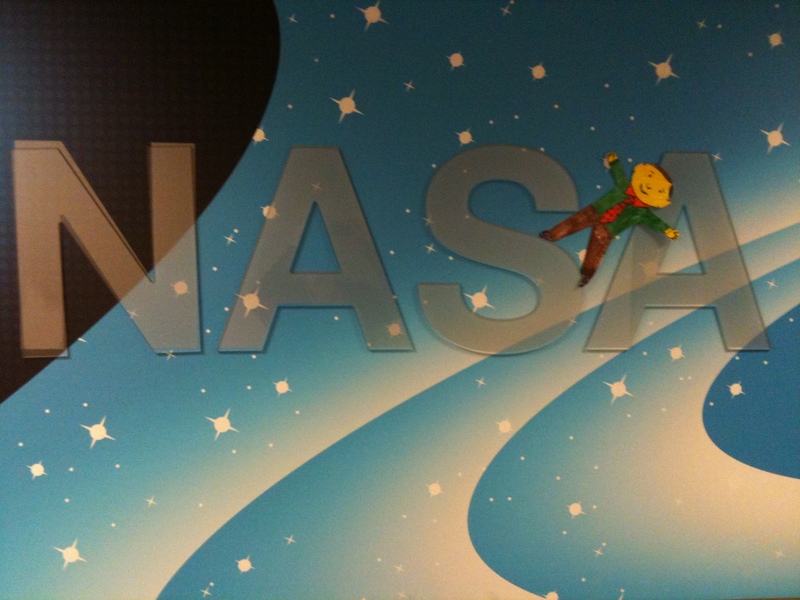 Here I am at NASA! 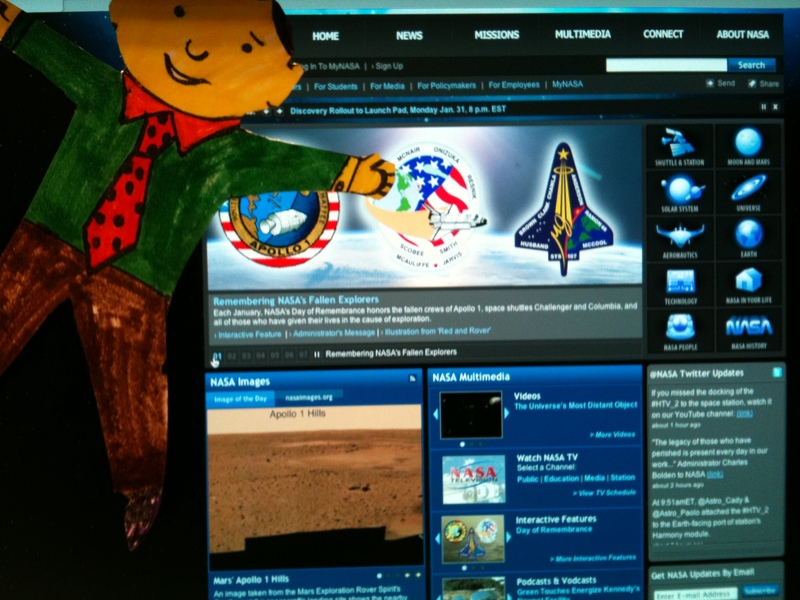 Here I am at NASA! Woot! I came to visit on an important day, NASA’s Day of Remembrance, when NASA honors fallen heroes who’ve given their lives to the cause of exploration. I learned about NASA's Day of Remembrance. I toured the building. 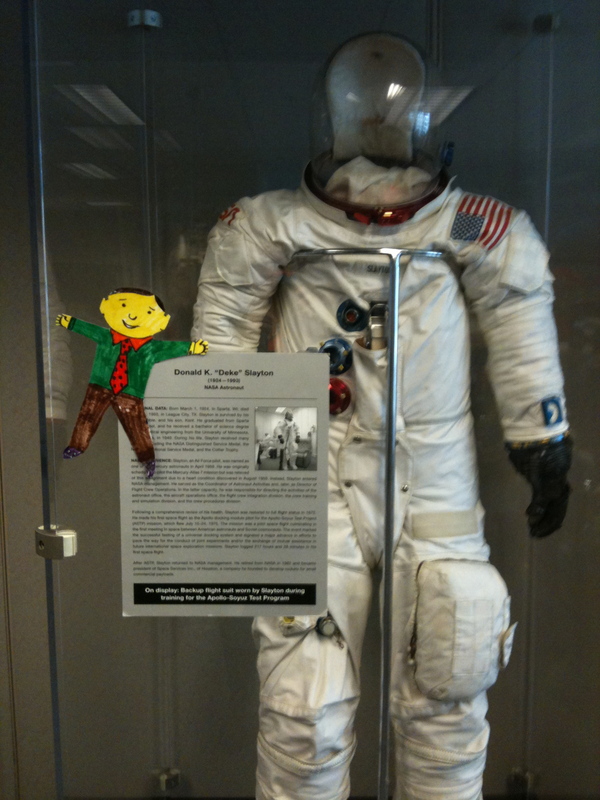 I found astronaut Deke Slayton’s spacesuit right down the hall from where Beth works. Deke was was one of the original NASA Mercury Seven astronauts, selected in 1959 (before I was born). He was the only member of the Mercury Seven not to fly. He was grounded because of a problem with his heart, but he ended up flying in space in 1975 with the Apollo-Soyuz test Project — the first time the U.S and Soviet Union worked together in space. Here I am with Astronaut Deke Slayton's spacesuit. I met Robonaut Centaur. Pretty cool dude. He rolls around on a rover base. He’ll help astronauts who are working on the surface of another planet. He’s kin to Robonaut 2, robo-humanoid STS-133 crewmember launching to Space Station on February 24. 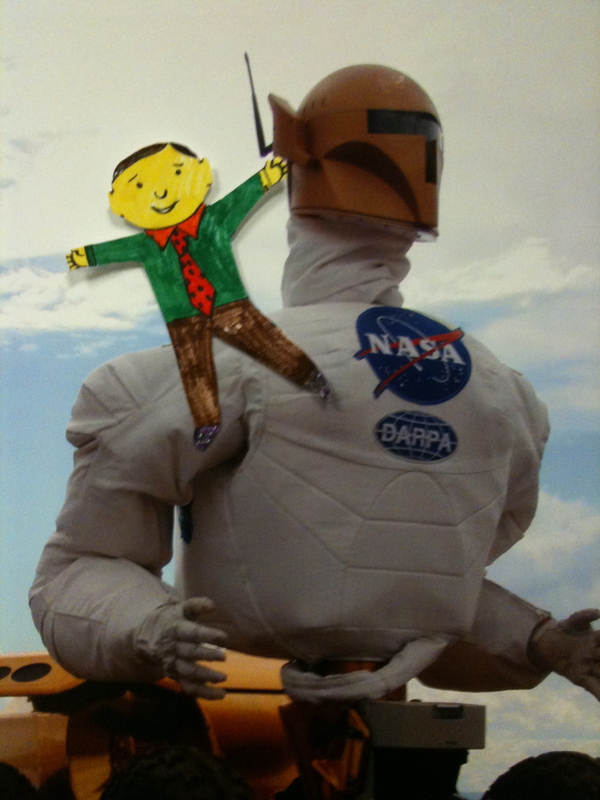 I met Robonaut Centaur, cousin to STS-133 Robonaut2. 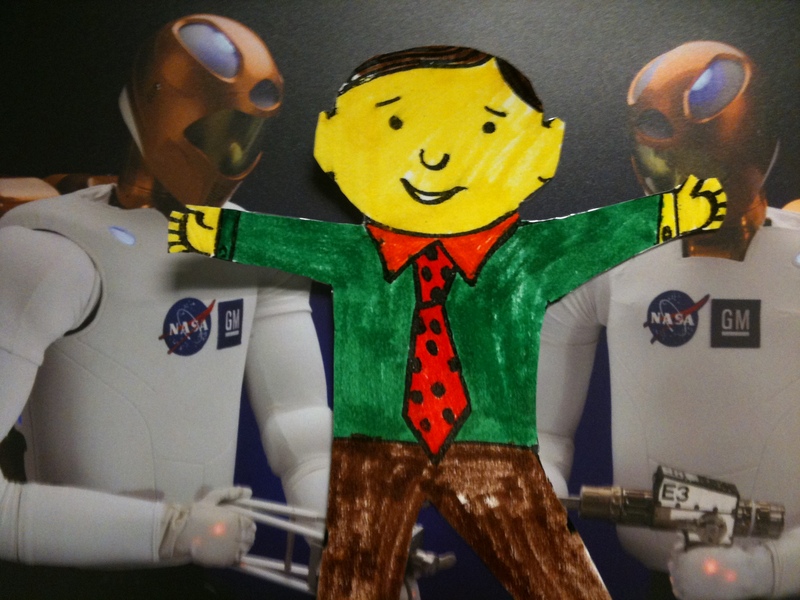 Here I am hangin’ with my new peeps, the RoboTwins: Robonaut 2 and Robonaut 2. They were duking it out over who gets to launch onboard STS-133 Space Shuttle Discovery on one of the final missions in the Shuttle program, scheduled for February 24. 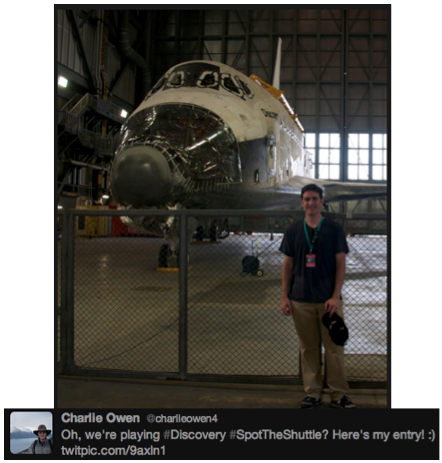 I inspected a Space Shuttle up close and personal. It’s really high way up at the top. Check it out! Here's my Tank Top View. 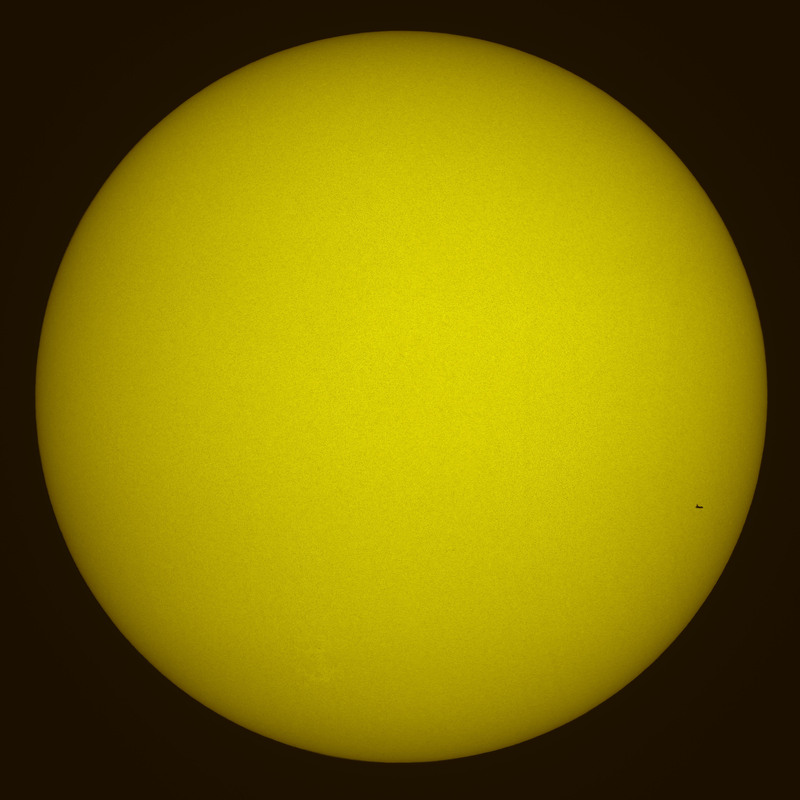 Original photo by NASA's Bill Ingals. 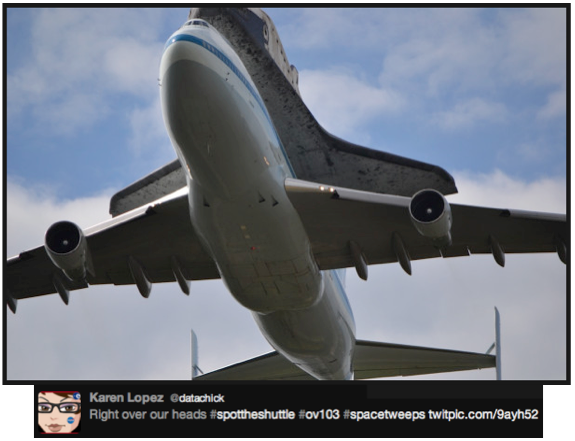 Here’s what a bird would see when a Space Shuttle launches. Pretty amazing, don’t you think? I can’t believe we’ll only have three more launches EVER in the history of mankind. 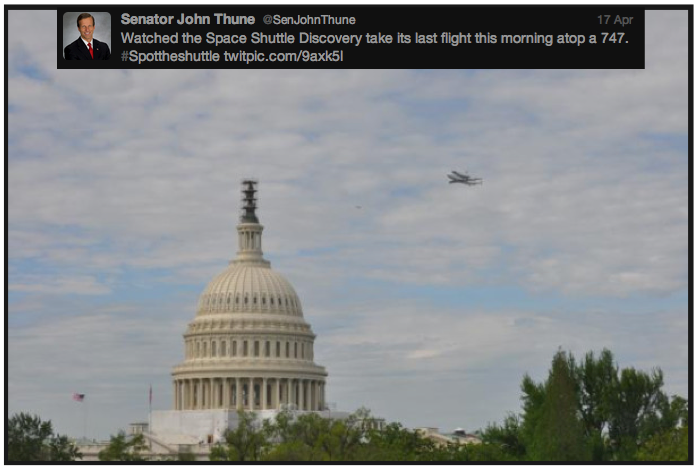 Only three more Space Shuttle launches EVer! Once we get off the planet, though, we can see sights like these. 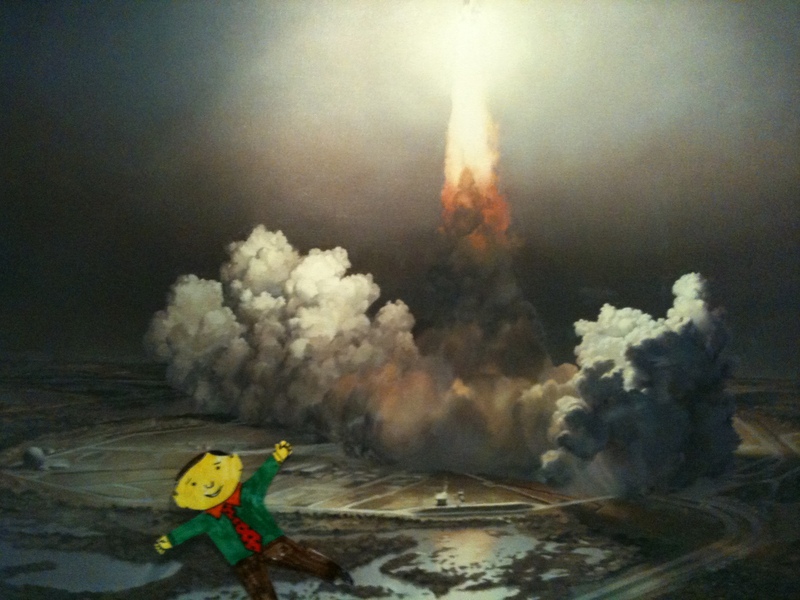 Come along for the rocket ride. The International Space Station orbits 220 miles over Earth, circling the globe every 90 minutes at a speed of 17,500 mph with a international crew of six. Another view of Space Station. Moon tour: Nope. No cheese! 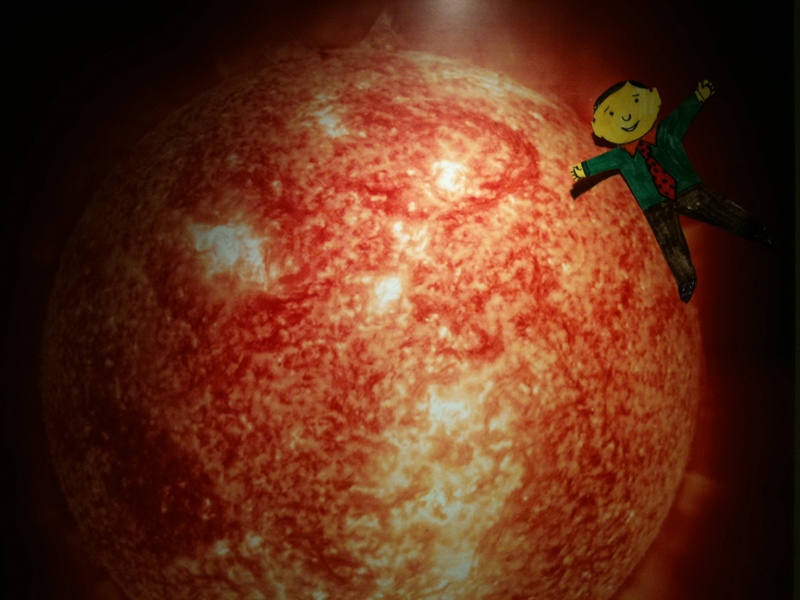 Sun: Man, this place is HOT! Mars, the Red Planet. Humans could live here in the future. When humans travel beyond Earth’s atmosphere, they need protection from the harsh environment of space. Either a spaceship or spacesuit — to provide air, cooling and heating, and other essentials. Our atmosphere provides a radiation shield, but once we go further out, we need to provide protection. 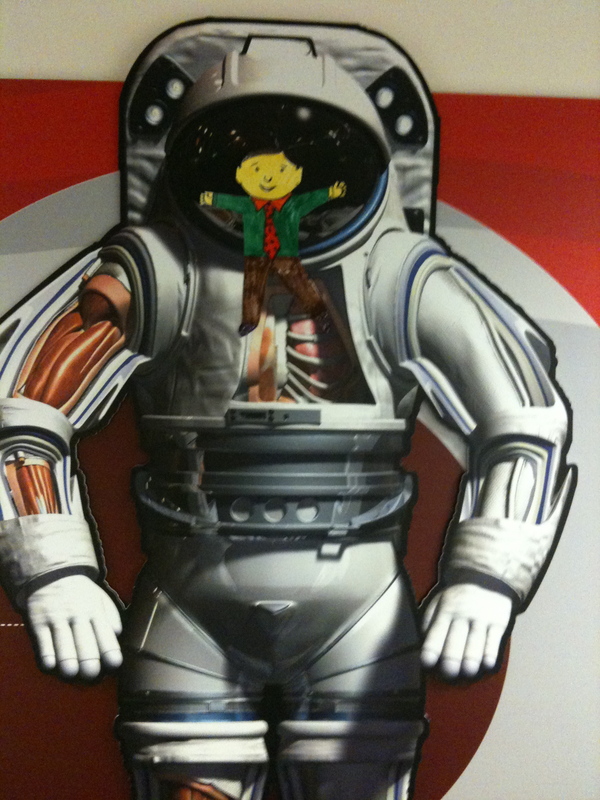 On the planet’s surface, whether Moon or Mars, we’ll need a hardshelled suit, like the one I tried on. But I don’t think it fits. Do you? 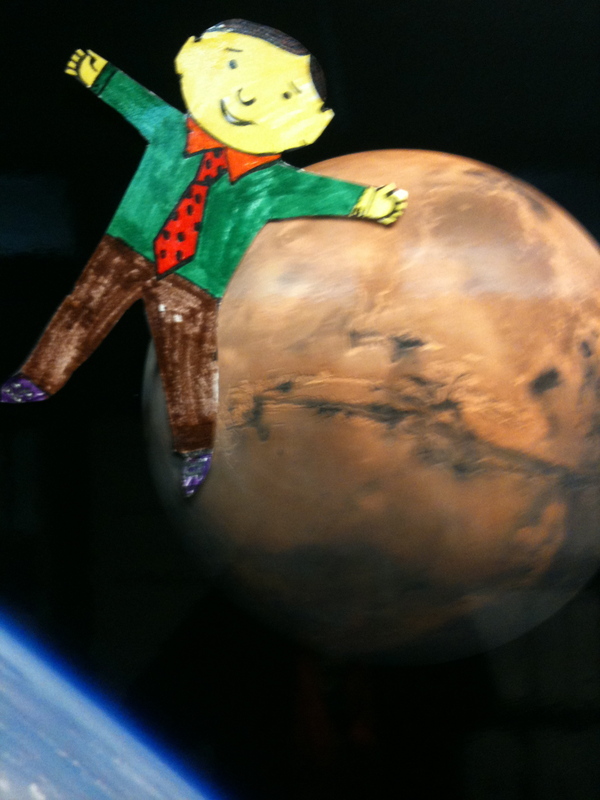 I'm trying on the Mars suit. It's a bit big. Maybe someday we’ll have bio-shields or exo-skins that protect us without a spacesuit. Maybe Nathan and his classmates will come up with a technology breakthrough that NASA can use. Highlight of my visit: I met a real live astronaut! Really. I promise. 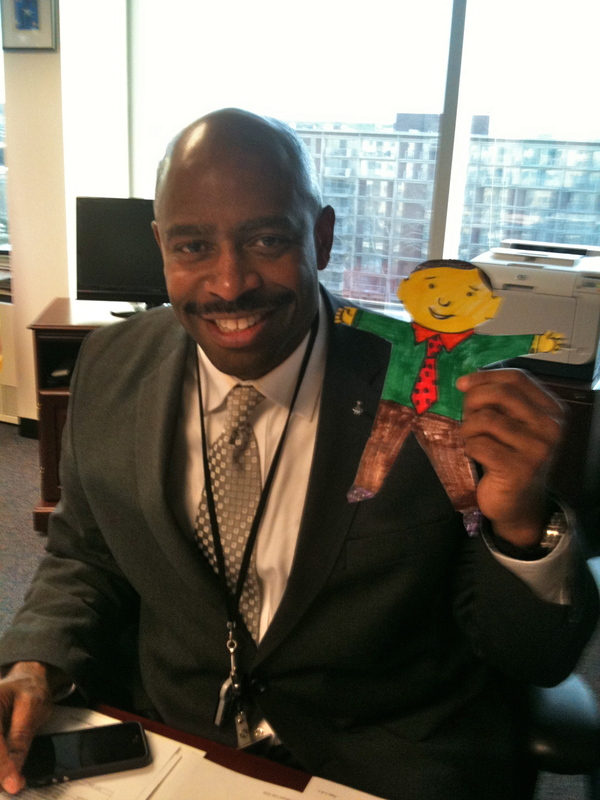 Not only is Leland Melvin a spaceman, he’s also the Chief of Education at NASA. He really likes kids. You can tell. He stopped a meeting to pose for a picture with me. Cool dude! Here I am with astronaut Leland Melvin! Leland spent over 565 hours in space during two Space Shuttle missions: STS-122 in 2008 and STS-129 in 2009. He also played football in the NFL with the Detroit Lions in 1986, as well as the Dallas Cowboys and Toronto Argonauts, until injuries kept him off the field. Good thing for NASA. Don’t you think? Maybe someday I’ll go live on Mars. I don’t weigh much. I don’t eat anything. I don’t need radiation protection, or even a spacesuit, for that matter. 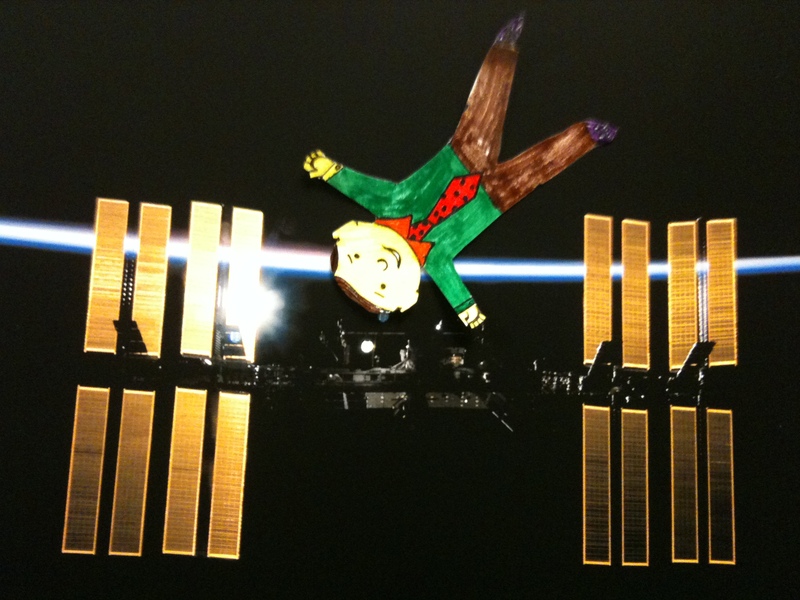 If Robonaut can be part of a space crew, I think a flat boy should have the chance. Leland and I are buds now. Maybe he can put in a good word for me. Hmmm. 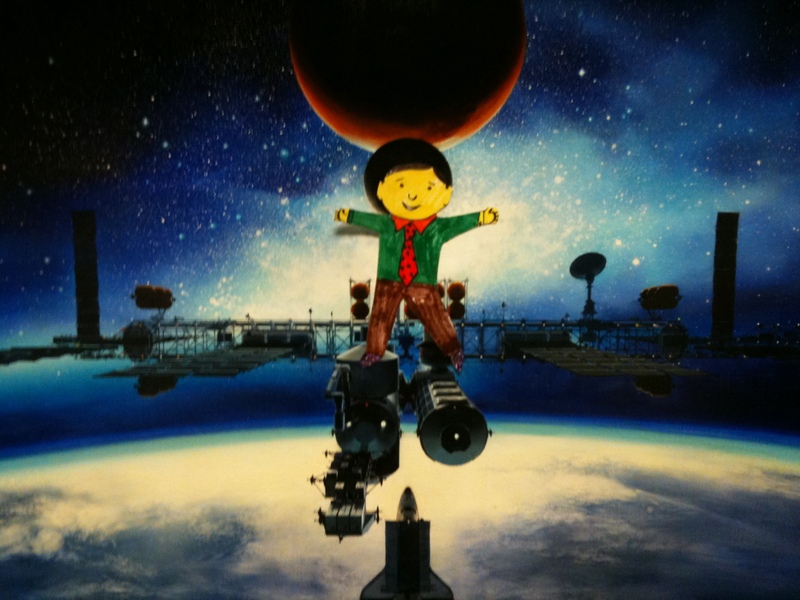 I hope you liked my space adventure. I learned alot about NASA. I hope you did too. Oh, and you can Facebook me, if you want. I have my own page. But for now, I need to get back to Nathan’s class. Time for me to get into the mailer, so Beth can get me to the post office. When I get back to Texas, I’m going to make sure Nathan asks his mom to let me watch live views from Space Station on the NASA TV channel on the web. You can too. 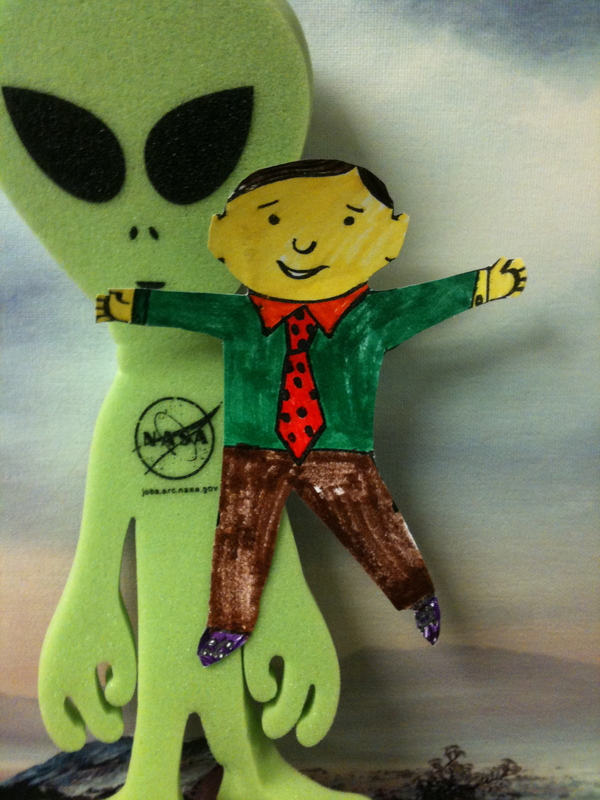 NASA discovered alien life after all! In the mid-90’s, I recall a conversation with German Space Agency liaison, Gerhart Brauer — both a colleague and good friend to me. I struggled with a painful chapter in my life, and Gerhart offered this one simple phrase that made all the difference at the time. And even today. Sometimes, though, this concept can be hard to accept. Personally and professionally. Take the end of our beloved Space Shuttle program, for example. Only three flights left. EVER! My sister Aimee recently reminded me how she and Daddy watched Columbia lift off on April 12, 1981. She remembers him marveling that we could actually launch a rocket from Earth and fly it back to the planet like an airplane. The concept was so unbelievable at the time. We take it for granted today. I don’t recall the launch at all. 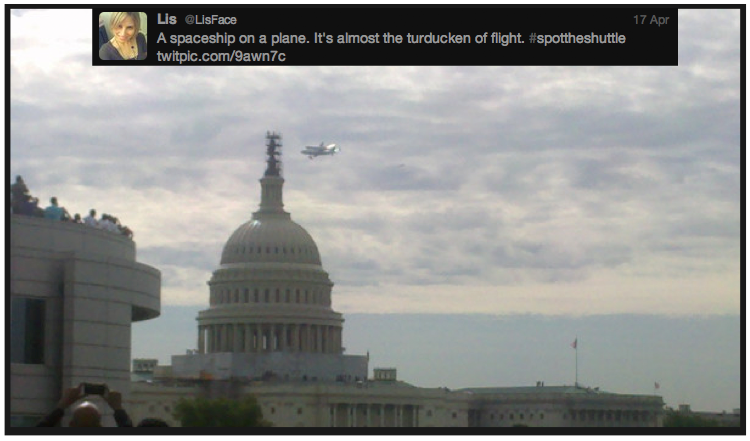 But, I remember the STS-1 landing two days later. I worked at the University of Texas Ex-Students’ Association in Austin. We gathered around the conference table to watch Columbia land. I remember how cool it was to meet STS-1 John Young and Bob Crippin for the first time a few years later. 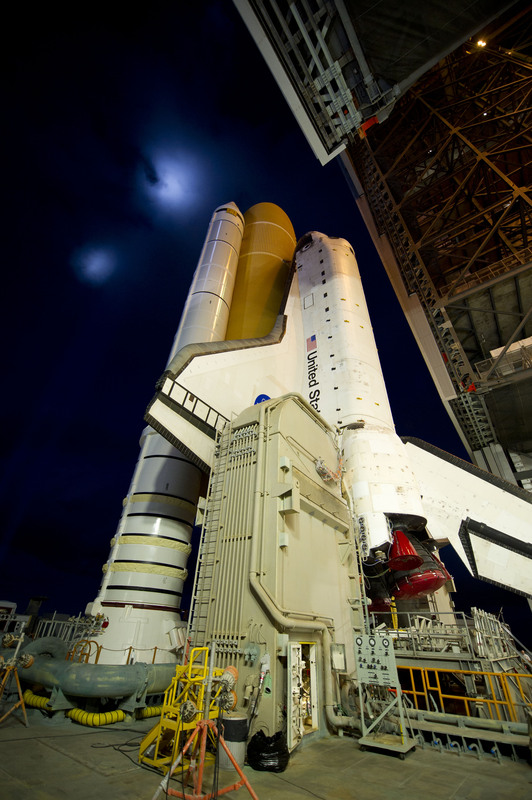 They were the first humans to put their lives on the line and strap themselves onto the Shuttle stack for launch. But then again, every astronaut who has ever flown on a rocket ship takes a leap of faith — each time we ignite the engines. Yes, the fleet of amazing reusable winged vehicles served us well over the last three decades (with the exception of our tragic loss of the Challenger and Columbia crew and vehicles on two missions: STS-51-L and STS-107). 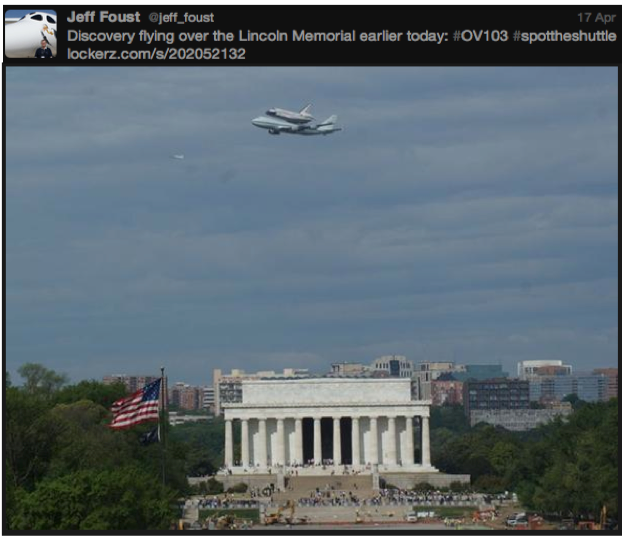 We don’t relish mothballing the remaining three vehicles: Atlantis, Discovery and Endeavour. But think about the exorbitant cost of upgrades. Cost alone makes the close-out decision for NASA managers so much easier than for those on the outside looking in. Let’s face it, many of us are mourning the end of the program. And that’s ok. Grief is a reasonable human response. We love to watch our winged vehicles soar into the air, breaking gravity’s grasp on humanity. Those of us fortunate enough to witness a Shuttle launch live, love to feel the ground-shaking rumble and the roar of the engines. Some have even seen the night-sky turn to day as the vehicle propels to the heavens above. It’s a bird! It’s a plane! 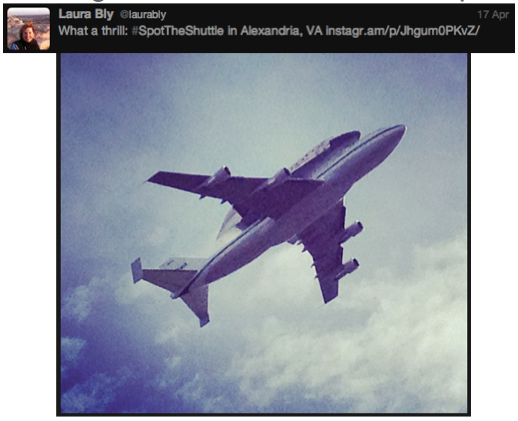 No, it’s a Space Shuttle!!! So what happens next? 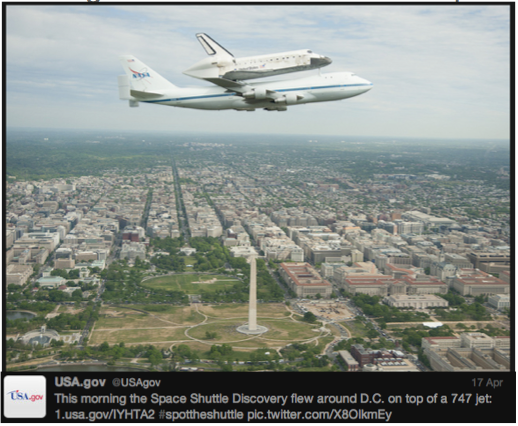 What follows the Space Shuttle program? So many ask. Many are angry and confused. I don’t have the answers. Just know that NASA folks are furiously working to fill in the blanks. (We’ll fly on Soyuz spacecraft to Station in the meantime.) Beyond that, stay tuned. No comfort for thousands of workers who made house payments, put food on the table, and paid school expenses off Shuttle-related paychecks. I get it. My heart goes out to them. This post-Shuttle “new beginning” must feel like a black hole, where everything they know is disappearing into a powerful vortex outside their control. NASA has been planning this for years, but it doesn’t make the end of the program any easier. We humans don’t like change, do we? It’s uncomfortable. Messy, at times. We often prefer the certainty of misery over the misery of uncertainty. That’s why we stay in dead-end jobs or in joyless relationships. We’re funny like that. When change comes, we fight it, dig in our heels, complain to anyone who will listen. Does that sound at all familiar? But with every new beginning, comes new hope for a better tomorrow. If we can only let go of those things we cling tightly to, we might have two arms free to embrace this scary, unknown new thing — sometimes called a fresh start. Here are a few ways to face change head on. Our Goal: Influence Change! Use the same tools in new ways. Find new tools to make old ways new. Look at a problem upside down and right side up. Sculpt your world into something better than ever existed before. BTW: The next launch, STS-132, is scheduled for May 14. We’ll be having our second Shuttle Launch tweetup at the Kennedy Space Center and a mission tweetup at the Johnson Space Center. Stay-tuned for stories about the launch and space tweeps I meet there. If you have stories to share about where you were and how you felt with the first Space Shuttle left Earth, feel free to post them as comments. I’d love to read them. Crosspost on OpenNASA.com and GovLoop.com. Women of the World. Literally! STS-131 Space Shuttle Discovery lit up the dawn sky this morning as she broke free from gravity’s grip to reach low Earth orbit on her way to the International Space Station. Onboard Discovery, three female astronauts: NASA’s Dottie Metcalf-Lindenburger and Stephanie Wilson and Naoko Yamazaki of Japan Aerospace Exploration Agency. They will join Space Station Expedition 23 crewmember Tracy Caldwell Dyson. Four women in space at the same time! How cool is that?!? 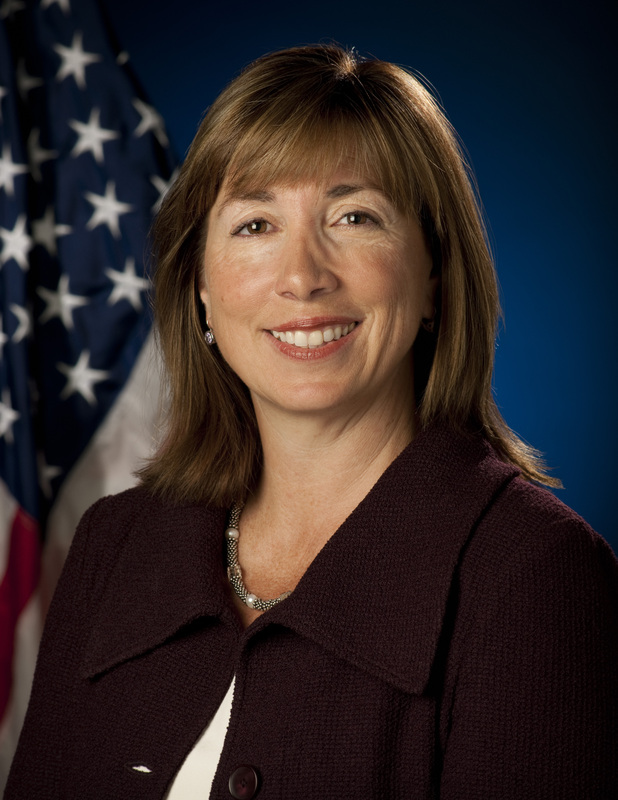 Not only did we launch three female astronauts into space onboard a rocketship this morning to join the fourth on Space Station, but we also launched our NASA Deputy Lori Garver into the Twittersphere with her first tweet from launch at the Kennedy Space Center. You can follow her tweets @Lori_Garver. 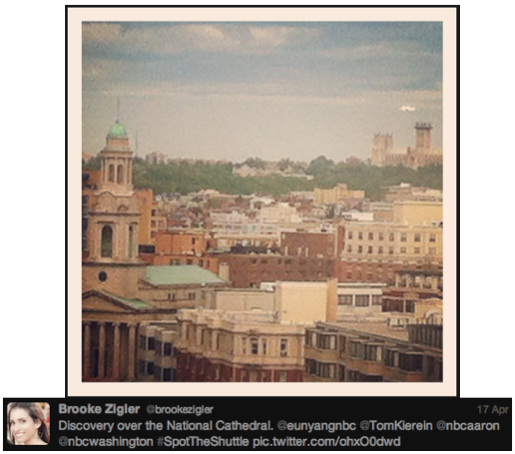 In fact, one of Lori’s first tweets inspired this blogpost. Lori also launched her Facebook fan page this morning. NASA’s social media presence ROCKets! So, girls out there in the universe: Take hope. Aim high. Work hard. Never let a little “no” stop you. Your WORLD awaits you, as we have proof today.